PROS: Fantastic graphics, compelling playability and a ton'o'fun. CONS: Nowt at this price. 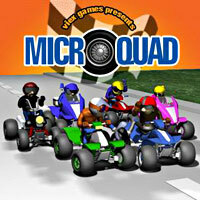 Anyone who enjoyed Mario Kart on the Nintendo SNES back in the 90s will love MicroQuad by Viex Games. Available on the Palm, Symbian Series 60 and Windows Mobile platforms, this is an old fashioned racing game that packs in an astonishing level of detail and playability. We tested the game on the Palm Treo 650 and the graphics were fun, fast, slick and ran as smooth as a slippery thing in banana boots sliding over an oil slick. You certainly get a lot of bang for your buck, with a total of twenty different tracks/levels (that's four unique tracks, each with five difficulty levels) and - apparently - some hidden unlockable tracks lurking within the game. Gamers start off by taking part in the Baby Cup, and once enough games are won, they can progress through the Junior Cup, Pro Cup, Master Cup and eventually the Expert Cup. At the beginning of each game you can select any one of six different bikes, each offering different strengths and weaknesses (road, off road and grip). 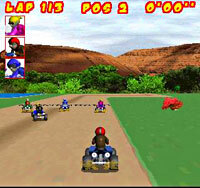 As well as navigating the ever-curving terrain at high speed, racers have to avoid oil slicks, sticky patches and missiles launched by competing karts. Playing the game proved to be a whole load of fun, with the bright, colourful tracks, lively animation and attractive scenery making it something of an immersive, compelling experience. Playing the game via the Treo's five-way controller was effortless, with the option to customise the placement and function of handset buttons via the game's options menu - and there's even a left-handed mode on offer! We had no problems running the game off our 2 GB Sandisk SD card and the game proved to be rock-solid in use with no crashes (and we've been playing it a lot!). 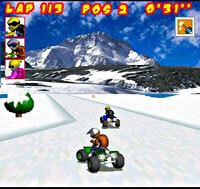 The game also offers an internet high score competition, a Bluetooth multiplayer option and a 'Quick Race' option if you fancy a quick blast around the tracks. We liked this game. A lot. It offers great value, exceptionally high quality graphics and a level of gameplay so addictive it can only be described as perilous. The game's tough enough to keep you coming back for more too, so you can expect a dramatic slump in productivity as soon as you install the game on your handset! MicroQuad can be downloaded from Viex.org for just $14.95 (�12, �8).